A well-known and much admired large-scale sculpture will be dismantled to make way for a pharmacy. The landmark art piece, officially named “Spindle”, is a towering sculpture of eight cars impaled by a giant steel nail. It became famous for its appearance in the 1992 comedy film “Wayne’s World”, starring Mike Myers and Dana Carvey. The sculpture is also known as the Car Kabob and the Eight Car Pileup. To this day, Spindle attracts movie fans to the shopping center parking lot which has been its home, located in Berwyn, Illinois, a suburb west of Chicago. From a marketing standpoint, I like the Spindle. It has definitely been a plus for the community. Regardless, the edgy sculpture will be removed this summer to make way for a Walgreen’s pharmacy. It could be moved elsewhere, though the cost of doing so would be high. Seems as though the “plus for the community” didn’t carry much weight in the face of big business. When compared to a pharmacy (which can be found on any street corner) the plus became a minus. Personally, I would have moved the Walgreen’s and left the Spindle where it is. The dismantling (of my art work) is painful and is a loss for Chicago. I couldn’t have said it better. What a shame. From the southlands; the Mutaytor, Lucent Dossier, David Starfire and others have all performed in the past or are performing this year. Check the lineup below and read through the cracks (?? ?people like New Orleans Social Club are members of The Meters and Neville Bros). The Sat night Techno Tribal party features STS9, Shpongle and Rabbit in the Moon performing among others and Anon Salon also hosts the ???Ambiotca??? party just across the way as well. On site camping is now available… Wow and Otter Oasis camps from BM have large presence there. 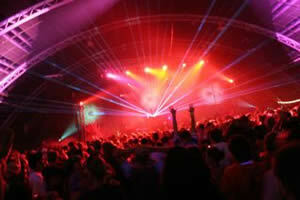 $32 per day / $32 Harmony After Dark late night shows. A limited number of pre-sale day and night tickets ($32) are now available at all ticket outlets and at HarmonyFestival.com. $37 tickets will be available at the gate. Access to Harmony After Dark is included in all VIP All Weekend Magic passes ($500) and in All Weekend/Day/Night passes ($149 without camping/$169 with camping). Get into “The Zone” and experience the all NEW HARMONY AFTER DARK concert series, a self-contained, indoor and outdoor, night-time entertainment zone for late night festival goers. GODDESS GROVE VARIETY STAGE, THE HOME DOME, THE CASBAH TEA HOUSE & TENT, LIGHT ART GARDENS, ALTARS, FOOD & BEVERAGES, CHILL DOMES, MYSTIC PROJECTIONS, BEER GARDENS, WALKABOUT STILTERS AND A MAGICAL NIGHT SKY ABOVE! Rafael and Katira & More. With decor magestry and Ambio-decor by MYSTIC BEAT LOUNGE, ANON SALON, GROOVE GARDEN, and INFLATABLE ARTS. Once a year there comes a sensorium extravaganza like no other… The fabulous Techno-Tribal Dance takes flight in a universe of 21st Century sound and light in the vast cathedral of Grace Pavilion. A sea of costumed, dancing people celebrate the moment to the music of top electronica artists, their eyes filled with jewels by a full spectrum laser array and vast airy beings that hang in space, painted with light and sailing in the sound field. Fire spinners dazzle the eye as daring aerialists soar through the dark reaches above the pulsing crowd, whose bones are vibrating with massive bass beats. Then fantasy forms and dream beings on stilts cut a path through the happy dancers, bringing with them an element of – what? Ritual? Magic? Birth of something so novel we cannot name it, but we know we want it and it’s here! VJ TEK – & MANY MORE! 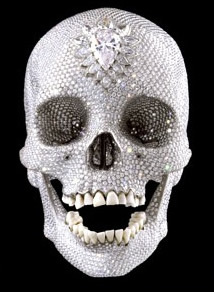 Artist Damien Hirst’s platinum cast of a human skull, titled “For the Love of God”, is covered with 8,601 “ethically sourced” diamonds. Its estimated worth is said to be over $98 million. I’ve heard that the this piece will be displayed on the Playa this year, but that it will have machine gun armed guards nearby and snipers at the fence line within scope-sight with night-vision goggles. They have been given orders to shoot to kill. So don’t be getting any big ideas! I’ve also heard that there are some moles working the inside, trying to find out if this directive has come from the higher-ups within the Org, or from an outside source… Stay tuned… Bring kevlar. Some information from a friend of the community, Jazz singer Kate Stewart. Thanks for all you support in the past – please know how much it is appreciated! I honestly never thought that I would ever hear a CD (in this case an EP-CD) with both ?? ?Autumn Leaves??? and Leonard Cohen?? ?s ???I?? ?m Your Man??? as tracks, but Kate Stewart proved me wrong. Well based on this EP-CD, I can definitely conclude that Kate Stewart has the equipment (in this case voice) to become an excellent jazz singer. But natural ability alone does not guarantee that someone will evolve into being a singer ??? in another genre Linda Ronstadt comes to mind. I would bet though based on this effort that Kate will evolve into a fine jazz vocalist. She has been a lifetime devotee of jazz and began singing in clubs out East when she was 16, so her style is more polished than on most maiden efforts. She definitely shows more than glimmers of the singer she might well end up being. I tried, I mean really tried, to use another word, but alas for want of that other word her voice can best be described as sultry ??? which one would not expect based on the picture of the perky, svelte blonde beaming at us on the back of the CD. Mostly she knows how to sing. I especially liked he straight ahead interpretation of Johnny Mercer?? ?s ?? ?Too Marvelous for Words.??? Her interpretation of the Leonard Cohen classic was also quite good. She has an excellent combo backing her, and the arrangements allowed their abilities to be demonstrated without taking away from Kate?? ?s own efforts. All in all Kate Stewart is definitely worth a listen ??? it will be interesting to see how her career and style evolves. (Santa Monica, CA) – The transformation of raw materials into a cohesive art form can mirror the transformation of an addict’s life from one of desperation and chaos to one of hope and recovery. 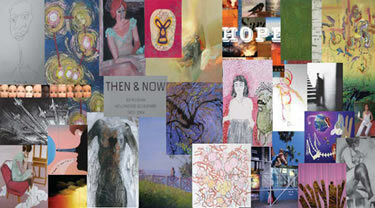 In recognition of the healing power of art, on June 3, 2007 the CLARE Foundation, a major Westside provider of services to primarily homeless and low-income alcoholics and addicts, will collaborate with the art community to present Art for CLARE at Bergamont Station Arts Center. Art for CLARE has invited over 35 local contemporary artists to participate in this one-day art auction and fundraiser, including Lisa Adams, Sophia Allison, Marcos Alvarez, Meredith Baxter, Quinton Bemiller, Judy Broumand, Rex Bruce, Richard Bruland, Mike Bullas, Jennifer Celio, Patrick Ceo, York Chang, Sarah Dunn, Carol Es, Colleen Flynn-Lawson, Judith Fox, Debi Gero, James Harrill, Susan Holcomb, Anthony Hopkins, Michele Jaquis, Gegam Kacherian, Sharon Kagan, Ursula Kammer-Fox, Jay Kelly, Elana Kundell, David Limrite, Larry Lytle, Meg Madison, Mela Marsh, Mery Lynn McCorkle, Bobbie Moline-Kramer, Doug Murphy, Glenn Ossiander, Ed Ruscha, Elizabeth Sadoff, Gina Stepaniuk, David Trulli, Kim Tucker, Jennifer Vanderpool, Claire Vesco-Felson, Ryan Villiers, Toni Waggoner, Susie White, and Leslie Yagar. The afternoon will feature live entertainment, and actress and comedian Rachel Tomlinson will emcee festivities. Local Westside restaurants including Sushi Roku, Enzo and Angela, Le Chef Bakery, Piccolo Ristorante, and Pizzicotto, will provide a tantalizing array of food, with beverages contributed by Riven Rock Winery and Espresso Etc. Violinist David Wilson and musical stylist David Roberti will provide the afternoon?? ?s musical backdrop. Funds raised at ART for CLARE will make a significant impact in mending the broken lives of people suffering from addiction; a portion of the art sales will provide support to CLARE’s 11 recovery programs. Four tickets to the event can provide a week in CLARE’s Detox/Primary program for one client. The sale of a signed book of Ed Ruscha photography can sponsor a mother and her child in CLARE’s Women with Children program for five weeks. Parking at Bergamot Station is free of charge. The CLARE Foundation is dedicated to providing services to all those suffering from alcoholism or substance abuse. An organization that began in 1965 with community members providing sobriety resources to the homeless alcoholics along Santa Monica’s beaches, last year CLARE provided recovery-oriented services to more than 25,000 men, women and children.